Coal gummy candy. 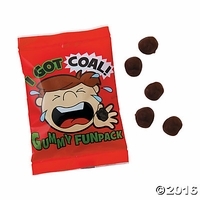 Buy coal candy gummy packs for filling your Christmas Stockings or goody bags. Black nuggets of root beer flavored gummy coal in individual packs. Yep it's coal for Christmas this year. 18 packs per bag each pack as approximately 18 pieces of gummy coal.